The ACCA EPA 608 Test Prep Course is a self-paced, online program that will aid you in your efforts to become certified under the refrigerant recovery and recycling program of the United States Environmental Protection Agency (EPA). Proof of certification is required to purchase refrigerants covered by Section 608 regulations. Please Note: This is a prep course for the EPA 608 Exam. This is NOT THE EPA 608 EXAM. Click here for information on taking/purchasing the real exam. This course is not designed to make you a qualified technician! Extensive on-the-job training coupled with related educational classroom sessions are a must for anyone who plans to be a competent technician. If it is your desire to learn about the trade through this document, you will be disappointed-there is no single book that can teach you everything you need to know about HVACR or any other industry. This unique resource is designed for technicians who already have a working knowledge of the trade and wish to become EPA 608 certified. EPA regulations (40 CFR Part 82, Subpart F) under Section 608 of the Clean Air Act require that technicians who maintain, service, repair, or dispose of equipment that could release ozone-depleting refrigerants into the atmosphere be certified. The test questions for that certification test were updated in 2018. The cost for the online program is $84.00. By the end of this course, students will have been exposed to every topic and question that could appear on the EPA 608 Test. By listening to each section of the online course and reviewing the accompanying online manual, you will have the resources you need to pass the test! To take the full course is just a little over 3 hours. You can access the course anytime of day, it's available 24/7. Just log in and pick up where you left off. Covers: EPA Wheel, Background, 608 Clean Air Act, 608 test format, Defining a technician, 608 test types, 608 certification, resources/links and Definitions of Section 608 terms and more. Covers: Environmental Impacts, Ozone Layer, Stratospheric Air Samples, Classifications of CFC, HCFC, HFC refrigerants, etc., and more. Covers: Clean Air Act, Phase out dates, Venting prohibition, Montreal Protocol, and more. Covers: System-dependent vs. Self-Contained equipment, 3rd party certification, refrigerant sales restrictions, Recover, Recycle, Reclaim, and more. Covers: Refrigerants states and pressures, gauges, service valves, leak detection, leak rate, and more. Covers: Recovery techniques, Good evacuation practices, proper documentation, risks of exposure, ASHRAE 34 Limits, Reusable Cylinders, and more. Covers: Small Appliances: definitions, evacuation requirements, techniques, pressures & temperatures, methods of recovery, and more. 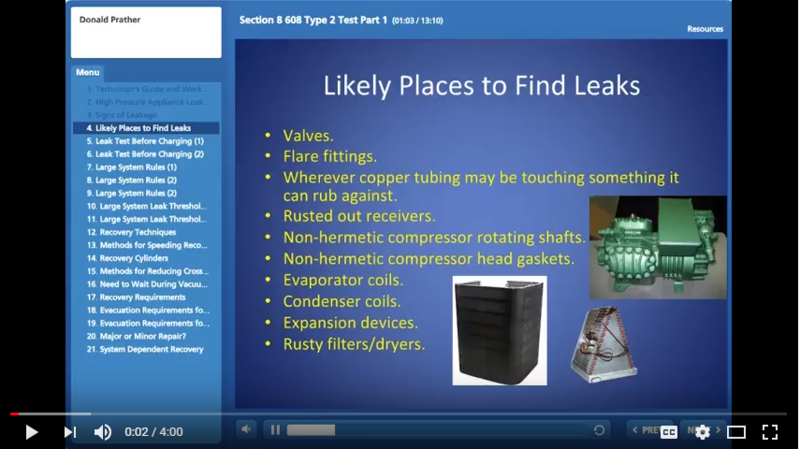 Covers: High Pressure Appliances: signs of leakage, large system rules, recovery techniques, reducing cross contamination, evacuation requirements, and more. Covers: High Pressure Appliances: trigger rate, EPA program dates, refrigeration, pressure temperature relationships, components of high pressure appliances, safety, and more. Covers: Low Pressure Appliances: signs of leakage, maximum leak inspections, leak inspection requirements, and more. Covers: Low Pressure Appliances: leak repair requirements, commerical refrigeration, retrofitting vs. retiring, evacuation requirements, safety, and more. Once you are in, you will see a 4 part video instruction. You can access the course anytime of day, it's available 24/7. Just log in and pick up where you left off. Once you have completed each section, there is a multiple choice quiz, you need to earn 70% to pass.